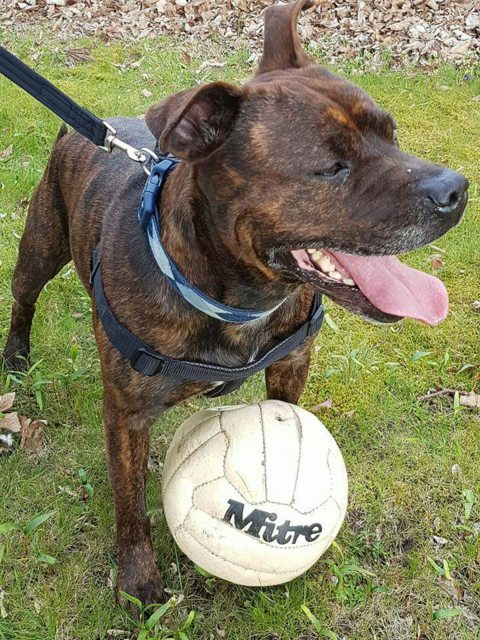 Alfie is a brown brindle male Staffordshire Bull Terrier aged about 5 years. Sadly Alfie in kennels at the moment. Though amazing with teenagers and adults Alfie is not happy round young children in the house so any children should be of teenage years. Alfie is fine with dogs when out and about but needs to be only dog in the home. Alfie is a lovely dog and really deserves his chance to get into a home and out of kennels. He loves a football though they dont tend to last long. We are looking for a foster of forever home for Alfie.He is currently in the Wickford area but can be homed throughout East Anglia and surrounding counties.